The two biggest euro zone countries want to limit the European Commission’s antitrust powers, and subsidise strategic sectors. Their fear of Chinese dominance is fair. Yet the reforms may help governments to prop up national champions, and undermine the bloc’s single market. 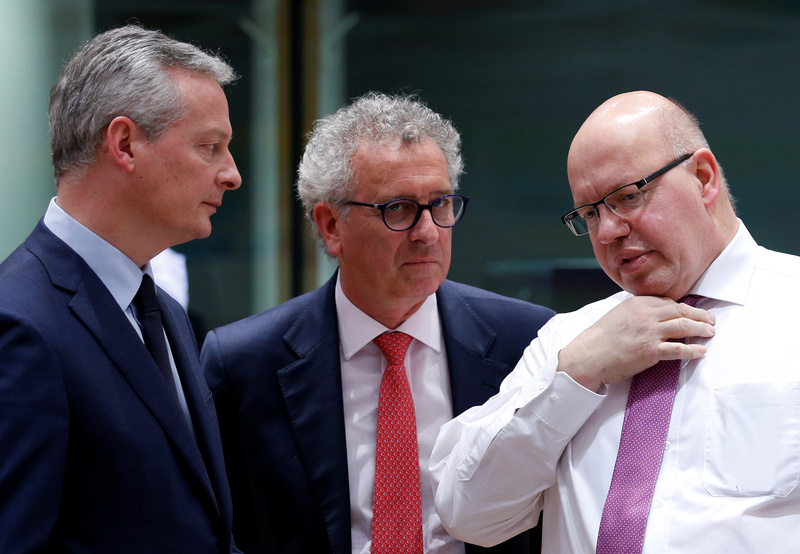 French Economy Minister Bruno Le Maire, Luxembourg's Finance Minister Pierre Gramegna and Germany's acting Finance Minister Peter Altmaier attend a eurozone finance ministers meeting in Brussels, Belgium, February 19, 2018. France and Germany on Feb. 19 released a 'manifesto' for the European Union’s future industrial policy. The strategy was based on three principles: increasing investment in technological research, revised antitrust and state aid rules to help EU companies compete globally, and stronger defences against foreign takeovers. The document, presented by German Economy Minister Peter Altmaier and French counterpart Bruno Le Maire, raised the idea of giving governments the power to override European Commission antitrust decisions in 'well-defined cases, subject to strict conditions'. The commission recently vetoed the merger of train builder Alstom with Siemens’ rail unit. That deal was supported by French and German politicians.